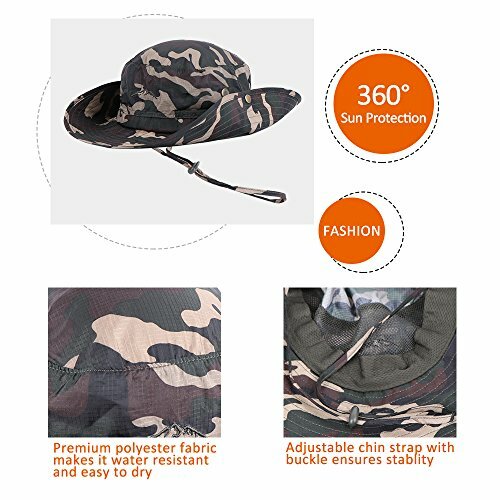 ULTRALIGHT and QUICK DRYING: Anyoo sun hats are made of lightweight polyester fabrics and dried quickly after getting wet while swimming/playing in the ocean. The wicking material will not make your head hot and sweaty even in the hot afternoon sun. Machine washable and line dry. 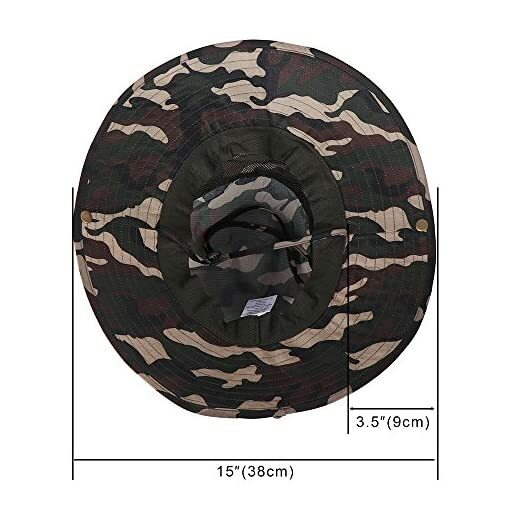 LARGE and FITS ALL: The hat circumference is 22 4/5 inch (57 cm),which is large enough to fit those who has thick hair, and the size is adjustable while it has a drawstring around the hat. Furthermore, the adjustable chin strap with anti-drop button is great for when you want to take it off for a minute and just toss it over your back. Also, it can keep this boonie hat stable in a strong windy weather. COMFORTABLE and BREATHABLE: This hat features larger vents for better ventilation, extremely breathable with multiple mesh areas for air to flow through easily. The omni-wick headband ensures good breathability while keeping moisture at bay which keeps your head cool at all times. 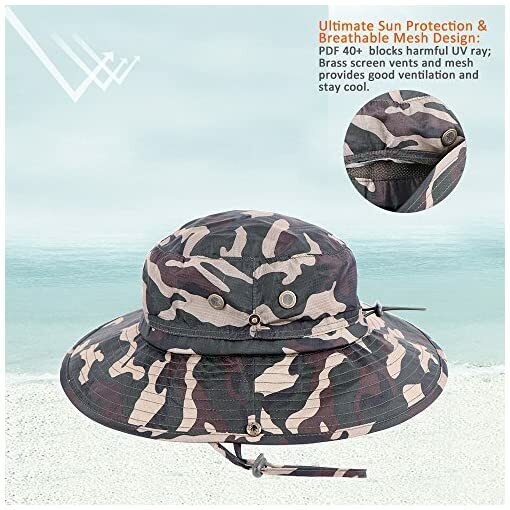 GREAT SUN PROTECTION: The UPF of the hat is 40+.The large brim of hat can keep your face and neck in the shade, and it provides more coverage than a bucket hat. 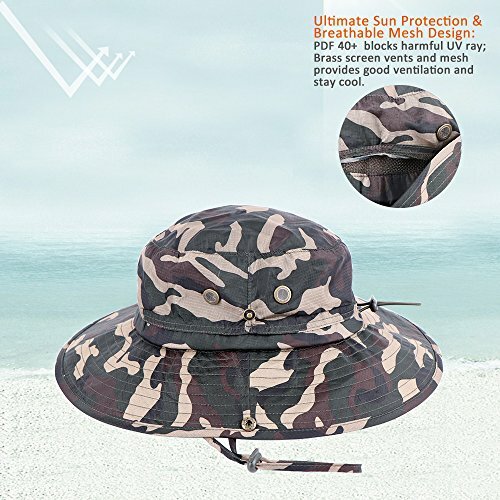 It gives wonderful protection from those skin cancer causing sun rays. This will be a life saver for outdoors people. 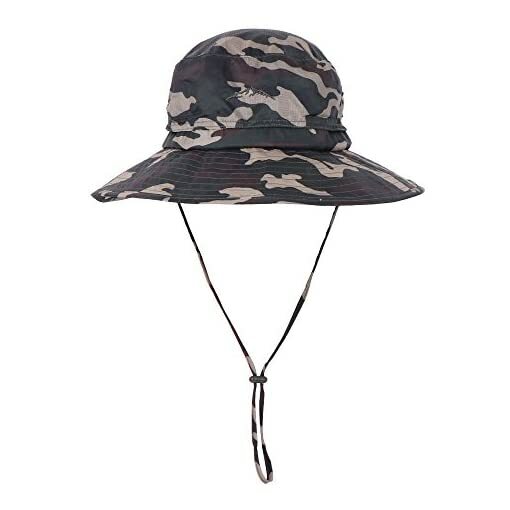 MULTI USES: These boonie hats are perfect for people who are engaged in outdoor recreation such as fishing, hunting, camping, hiking and many more. 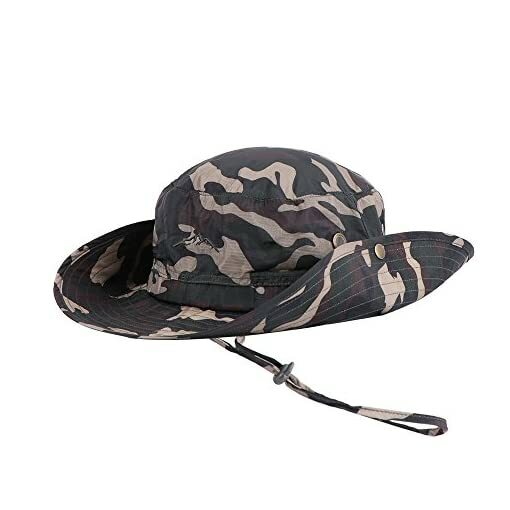 With this hat, you can spend more hours in your garden cutting the grass. This time, don’t be afraid of the sun and enjoy nature.